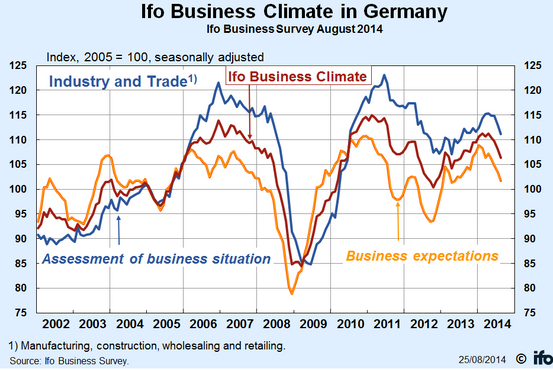 The German business climate index tracked by the Ifo Institute declined more than expected this month, making it the 4th drop in a row. The Guardian: - German business sentiment dropped for a fourth straight month in August as concerns about the Ukraine crisis and the effect of sanctions against Russia swept through corporate boardrooms in Europe's largest economy. The Munich-based Ifo thinktank's business climate index, based on a monthly survey of about 7,000 companies, fell to 106.3 from 108, below the Reuters consensus forecast of 107. A large part of the decline was of course due to the Ukraine crisis, but that was not the only cause of Germany's deteriorating private sector growth. Slowing exports to the rest of the euro area nations due to weaker demand as well as persistent economic headwinds in China (see discussion) have contributed as well. This means that Germany is unlikely to support any further sanctions on Russia and will make a concerted effort to stabilize the situation (in spite of any pressure from the US). 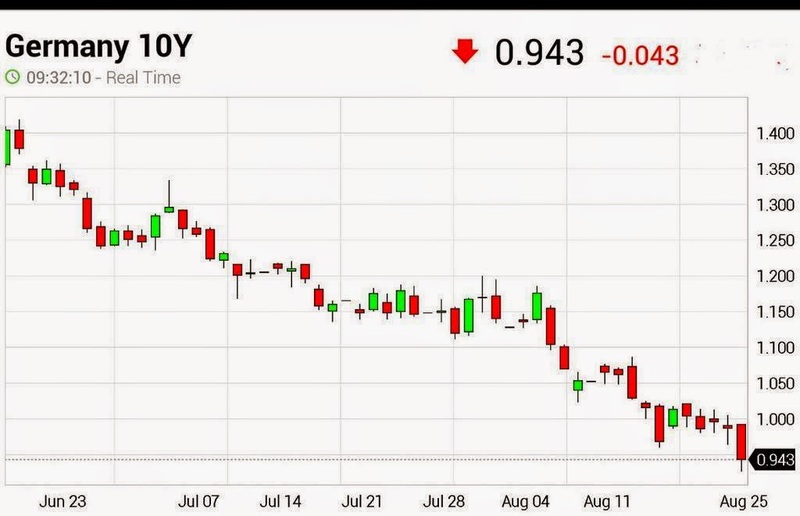 The market reaction was swift, with the 10-year Bund yield hitting another record low. Investors also piled into the three-year government notes, sending those yields into negative territory for the first time since 2012. 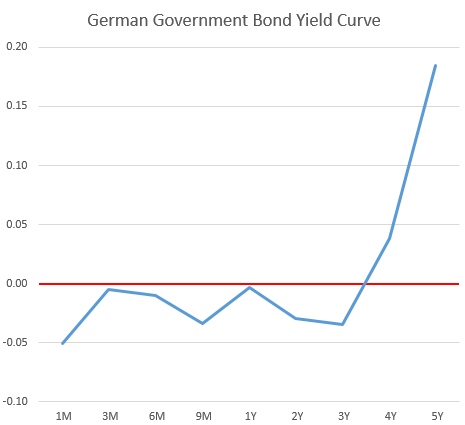 The German government is now getting paid to hold your euros for three years. In fact the nominal yield curve is in the negative territory all the way through the three-year point and showing signs of inversion - with the 1-year yield higher than the 3-year. The euro dropped below 1.32, with rising expectations of diverging monetary policies between the US and the Eurozone. This was fueled in part by the Jackson Hole conference where Janet Yellen's speech was not as dovish as some had expected. The currency weakness will deliver some much needed relief for the euro area by helping the exporters and by providing some support to import prices. Currency weakness is one way to arrest deflationary pressures – the Japanese way.